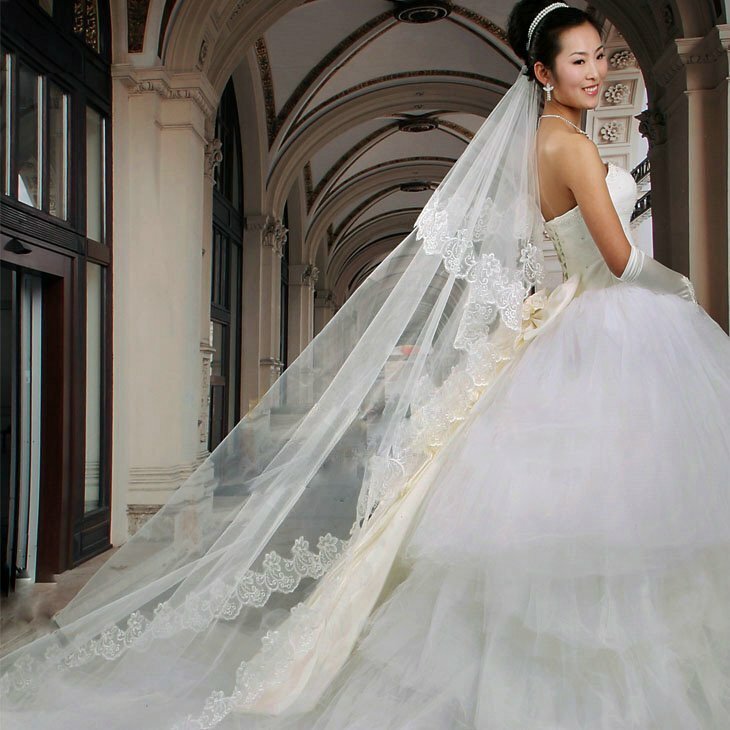 The wedding train is the part of the skirt that gives it the length. The length depends entirely on YOU and what you think looks best for your wedding ceremony. Normally, the fancier the wedding is the longer the train will be. Back in the day the train usually determined your status, so how wealthier you are. Nowadays it is based upon how formal or informal your wedding is. There are a few different trains you can decide from, the sweep, court, chapel, cathedral, and monarch. Choose your train wisely! Be creative, if you want a long train for the ceremony but don’t want to have to fuss with a long dress for the reception get a detachable train. You can also have a bustle for your train. It is all up to YOU the bride! Have fun with it! Veils are all so very different, they come in whatever color the bride would like it in, and in which ever length they desire. Underneath are 5 types of veils. Ballerina: The length of a ballerina veil falls anywhere between the knees and the ankles. Chapel: This style is a bit more formal than the other types of veils because it extends about two yards from the head piece and extends to the floor. 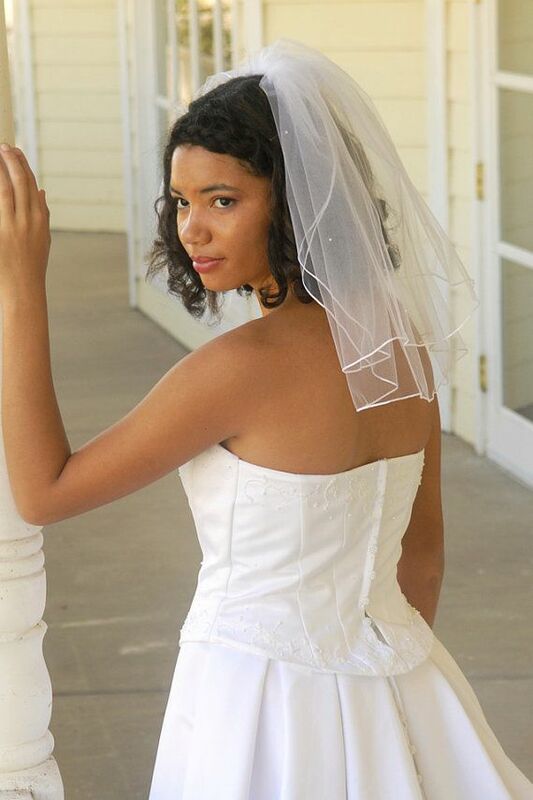 It is a wispy veil that is very light and elegant. 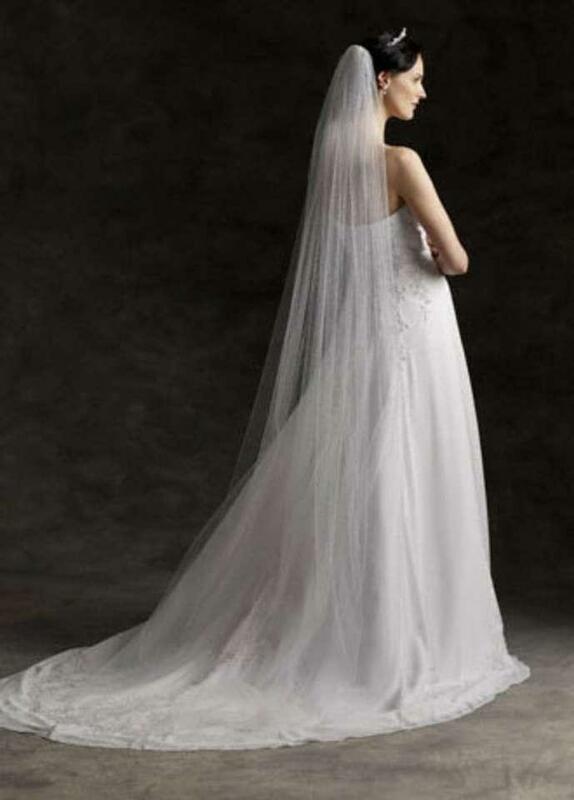 Cathedral: The cathedral veil is the most dramatic veil because it extends three and a half yards from the head piece. Three-piece: The three piece veil is a more formal look because it is three types of veils together, the blusher, fingertip, and chapel. Mantilla: This type of veil is draped over the brides head like a scarf and usually worn without a headpiece. The edges are usually laced to give the bride a dramatic and beautiful look. Veils come in all shapes and sizes, from long to short, to black or white. The length depends on the style of your dress, how fancy your wedding will be, and most importantly what you think looks best for your special occasion. You have a choice of a million different veils to choose from, however to help us all out the creators of the veils have managed to narrow them down to 10 styles. Blusher: This type of veil falls lightly over the brides face, the length ending just above the chin or a little underneath it. A great example of this is the Birdcage. 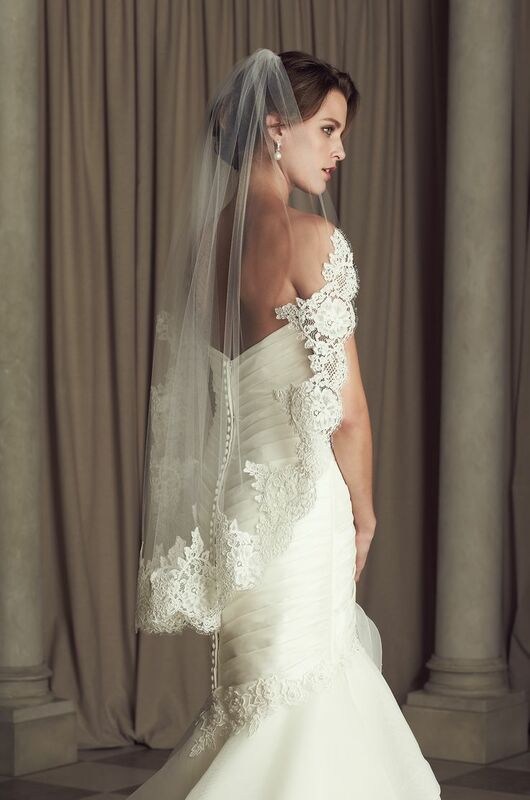 Flyaway: The flyaway veil grazes the top of the brides shoulders and has multiple layers in the back. This is great for a dress that has a beautiful detailed back because it is short enough to not cover up the dress. Elbow: The length of the elbow veil is perfect for a formal dress or a less formal dress because it extends to the elbow which is right in the middle of the shorter veils and the longer ones. Fingertip: When the brides arms are resting at their sides the length goes to their fingertips. This style is usually uses a few layers of fabric. Suits and tuxedos may appear to be similar in some cases, but in most cases there are distinct differences. Suits can be seen during formal occasions, such as weddings, funerals and business meetings. The shirt most men wear is a plain collared shirt usually dressed with a tie. Jacket labels are usually the same material as the jacket itself. The suit jacket worn can have from two to four buttons, they can be brown, black, dark grey, or navy blue. The pants are the easiest to tell whether it is a suit or a tuxedo because a suit does not have a satin stripe on the outside. The pants also have belt loops and can be cuffed at the bottom or not. Last difference are the shoes, normally with suits men will choose to wear comfortable formal shoes, like Derbies or slip ons. Tuxedos are seen during formal occasions such as weddings, prom, charity events, and award ceremonies. The shirts have a pleated front and cuff links or other similar accessories. The biggest difference between tuxedos and suits is the satin stripe on the trousers of a tuxedo. And to match the satin stripe is the lapel. The jacket lapels are seen in three different ways, peak, shawl, and notched. The jackets have one button, however the latest styles have been showing two or three buttons. The pants have no belt loops and are not cuffed at the bottom. Therefore, cummerbunds or suspenders are a required part of the attire. Last, shoes should be patent leather.